Barefoot Agent is a browser-based vocational rental platform that integrates Lead management and CRM tools. The software is built to be tailored to the needs of vocational rentals, property management companies, and resorts looking to scale the heights through innovation. It’s a reliable application that leverages modern technology and unique integrations to make vocational rental businesses more efficient in growing revenue. 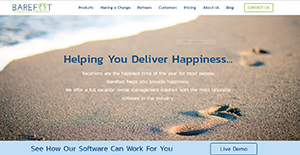 Barefoot Agent transforms your business into a fully-fledged vacation experience provider. It enables you to proactively manage every detail of your business with streamlined workflows for processes and communication. Some of its main features include Lead management, trust accounting, document management, CRM, front office efficiencies, online portals, add-on services, and partner integration and distribution. Barefoot Agent is a robust software with inimitable flexibility and ability to be customized to your business’s needs. It’s a scalable solution built to address the evolving needs of vocational rentals and property management businesses. The deployment of modern technology enables this solution to revolutionize the way businesses operate. Besides, its cutting-edge tools make businesses far more efficient and spur them to scale the competitive market with ease. This software provides a powerful trust-based accounting system. The accounting module is designed to suit your unique business needs and best account practices. It helps you access vendor, guest, and property data from a unified source while ensuring all payments and charges flow seamlessly. The module has stood the test of millions of dollar in transactions, and its integrity is unquestionable. Barefoot Agent provides robust Customer Relationship Management (CRM) and lead management tools. One notable tool is the integrated email feature. This tool construes inbound and outbound emails as comments in your system to facilitate better communication in your organizations. The automated email feature enables you to lay down rules and implement seamless communication to foster high-touch relationships with guests and staff. The Barefoot online portals are other notable tools. These features extend the access and functionality of the system for guests, owners, vendors, and referral agents. The online portals include Barefoot Owner Access, Barefoot Guest access, Barefoot Vendor access, and the Referral Agent Network. The Referral Agent Network (RAN) is a distinctive social media tool that empowers your business partners to manage their commission, serve as book inventory, and act as your reservation agents. It's essential to note that virtually no app in the CRM Software category is a perfect solution able to meet all the requirements of various business types, sizes and industries. It may be a good idea to read a few Barefoot Agent reviews first as certain services might excel exclusively in a very narrow set of applications or be created with a really specific industry in mind. Others may function with a goal of being easy and intuitive and as a result lack complicated functionalities welcomed by more experienced users. You can also come across solutions that support a wide group of users and provide a powerful feature base, but this in most cases comes at a more significant cost of such a solution. Be certain that you're aware of your needs so that you pick a software that provides exactly the elements you search for. How Much Does Barefoot Agent Cost? Barefoot has a simple enterprising pricing based on the number of units in a 50 units increment. The first tier (1 to 50 units) is priced at $450 per month plus a $6500 for a one-time setup fee. We realize that when you make a decision to buy CRM Software it’s important not only to see how experts evaluate it in their reviews, but also to find out if the real people and companies that buy it are actually satisfied with the product. That’s why we’ve created our behavior-based Customer Satisfaction Algorithm™ that gathers customer reviews, comments and Barefoot Agent reviews across a wide range of social media sites. The data is then presented in an easy to digest form showing how many people had positive and negative experience with Barefoot Agent. With that information at hand you should be equipped to make an informed buying decision that you won’t regret. What are Barefoot Agent pricing details? What integrations are available for Barefoot Agent? If you need more information about Barefoot Agent or you simply have a question let us know what you need and we’ll forward your request directly to the vendor.